The Great Italian Chefs is the brand new exciting website from the folks over at the Great British Chefs– the team behind the fastest growing food website in the UK. After 5 years of the resounding success of the Great British Chefs, they have now launched another fabulous website- The Great Italian Chefs to showcase the best of Italian cooking, recipes, restaurants and culture. Italian cuisine is one of the most celebrated in the world, loved for its mouthwateringly delicious recipes and fresh flavours. A trip to Italy is as much for gastronomic reasons as it is for sightseeing. The Great Italian Chefs will take you on a virtual tour of Italy and dazzle your senses with mouthwatering recipes from top chefs. Your culinary journey will introduce you to the basics, the foundations of Italian cooking and its various techniques, and will tantalise your senses with a collection of recipes from 21 fabulous Italian Chefs. Recipes range from classic ones like ravioli onto really cheffy dishes that have veal, game, fish and to more intriguing ones like ‘ Fake Mozarella‘ – a mascarpone mousse with yoghurt sorbet. Not only this, the website also will help to plan your gastronomic journey better, it has a lot of information on the food specialities of different regions like Campania, Fiuli, Lazio and recommends restaurants that have exciting food to offer in each of these places. All in all, an exciting place to lose yourself. I was really impressed with the website and tried out a really pretty looking dish- Langoustines with Peas and Mandarin. It was the first time that I cooked langoustines from scratch- right from peeling them and I must say it was quite an experience. I was very curious about how the mandarin would work in this recipe- had initially thought of it as adding to the aesthetics than anything else. But what a revelation it was! To my surprise and delight they turned out to be the highlight of the dish shining through the otherwise bland pea puree and melt in the mouth buttery langoustines. The key to this recipe is in not over cooking the langoustines. They have to be cooked in boiling salted water for exactly one minute. Nothing more. 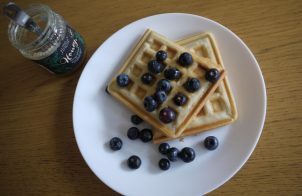 I urge you to try this recipe. 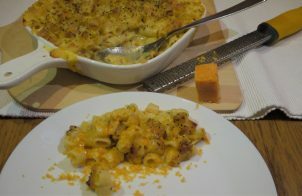 Make it and your chef skills will be appreciated far and wide! Blanch peas in boiling water. Then add 200 gm peas with some of the water to a blender Add in 200 gm butter and a pinch of salt. Blend to a puree and pass through a sieve to get it really smooth. Now this is the fiddly task. The remaining 100 gm peas need to be cut in halve- to decorate you plate. Halve them and keep aside. In a small saucepan, reduce the mandarin juice till you get the consistency of a glaze. That means a lot of stirring and watching. This would take 15-20 minutes. Set aside. In a medium saucepan, reduce the chicken stock to a sauce consistency and stir in the peas and 1/2 tbsp of the pea puree. 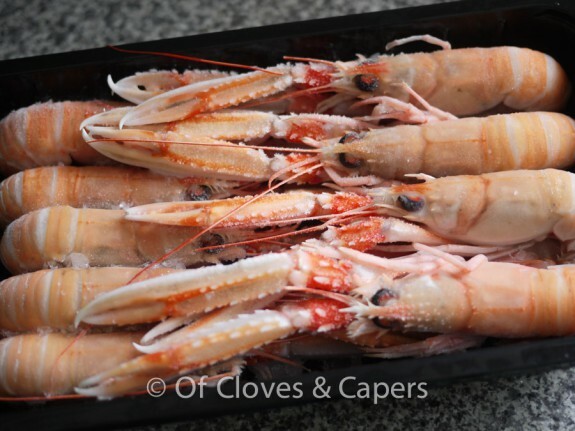 Now for the main star of the show- the langoustines. they need the minimum. Drop them into a large saucepan full of boiling salted water and blanch for just one minute. Drain and ten season with salt and pepper. To serve, brush the mandarin glaze onto a plate. Make an orange circle with it. To one side of this circle, spoon the pea puree in a small mound. 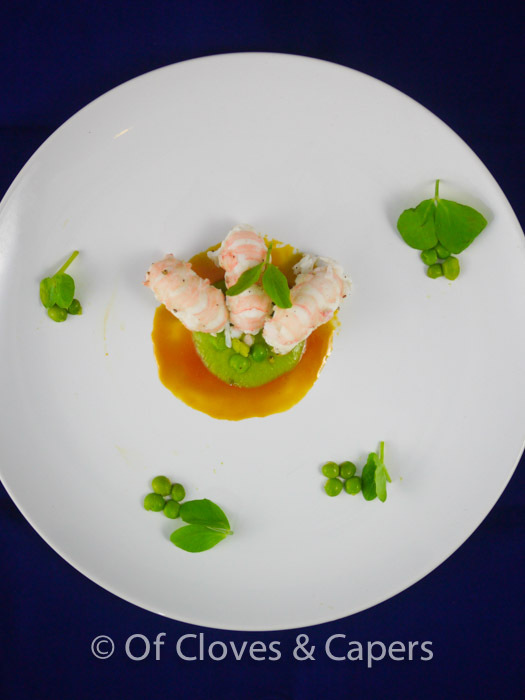 Place the langoustine on top and dot the plate withthe halved peas. 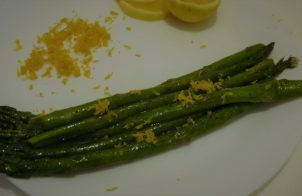 Garnish with pea shoots and serve straight away. This is a sponsored post for The Great Italian Chefs. Thanks to The Great British Chefs for reimbursing the cost of the ingredients. All opinions and views expressed herein are as always, my very own. 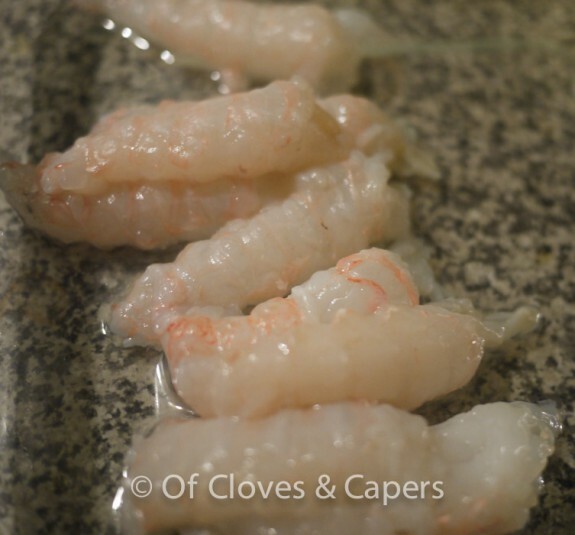 Recipe Type: Fish Ingredients: Langoustine If you like this recipe, please share, or leave a comment below. It only takes a click! Oh yes! It does and tastes too!